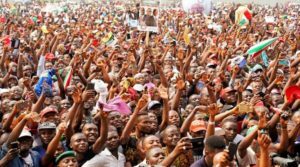 Despite being a work day, the Peoples Democratic Party, PDP, presidential and Vice Presidential candidates, Atiku Abubakar and Peter Obi have taken their campaign to Lagos where they received a warm welcome from their numerous supporters. In the entourage was the PDP presidential candidate; Atiku Abubakar, his running mate, Mr. Peter Obi, the Director General of the PDP presidential campaign; Dr. Abubakar Bukola Saraki, the National Chairman of the PDP, Prince Uche Secondus, the Governorship candidate of the PDP in Lagos; Mr. Jimi Agbaje and a lot of other dignitaries. The National Chairman of the PDP claimed that the party has uncovered plans by the APC to rig the election. He, however, said that the PDP will not allow that to happen. He also further tasked the attendees to vote PDP and defend their votes. 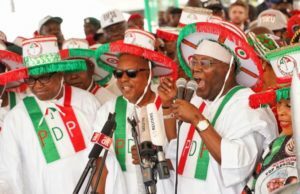 The VP candidate of the PDP, Peter Obi solicited votes based on the pro-business manifesto of the Atiku candidacy. Meanwhile, Abubakar, while speaking, reminded the people of his resolve to create jobs. He admonished the people of Lagos to vote him for the jobs and wealth he intends to create for the business hub of the nation.